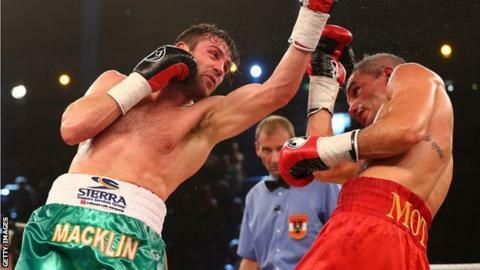 Three-time world title challenger Matthew Macklin says he will retire if he loses to Jason Welborn when the two clash in Birmingham in October. "It's a step down for me but sometimes you have to regroup," said Macklin, who has lost six of his 38 contests. "If I lost I'd definitely retire. I still want to be a world champion." Macklin, who unsuccessfully fought for the world middleweight crown against Felix Sturm,Sergio Martinez and Gennady Golovkin, agreed to take on 29-year-old Welborn after the Black Country fighter's original opponent - Commonwealth champion Sam Eggington - was pitted against ex-world amateur champion Frankie Gavin. Macklin's first shot at a world title came in June 2011 when he contentiously lost a split-decision to Germany's long-time champion Felix Sturm in Cologne. He floored the great Argentine Sergio Martinez in his next title bout nine months later, but was eventually forced into an 11th-round retirement. Macklin suffered a more comprehensive defeat when he was knocked out in the third round by current unbeaten champion Gennady Golovkin two years ago. "I can't afford to drop down to his level," Macklin told BBC WM 95.6. "I'm several levels above, I've consistently proved that. "I'm conscious it's going to feel like a world title fight for him, so he's going to box out of his skin. He wants to get where I've been and I want to get back there - I have to train hard and do everything right." Macklin contemplated quitting the sport after losing by knockout to Jorge Heiland in November last year, but bounced back by winning his last fight - the 32nd victory of his career. Despite dropping down a weight level to meet Welborn, who has won 17 and lost three of his 20 contests, Macklin does not envisage that being an issue. "They're probably hoping I struggle to make the weight but it's not going to be a problem," Macklin said. "I feel like going down to 154 pounds will give me a new lease of life."